Autoflowering cannabis produces its bud with time, rather than light. However, they still need consistent lighting, so getting the schedule right is crucial. Here is what you need to know. As the name suggests, autoflowering cannabis strains automatically flower with time, no matter what light schedule is received. However, ensuring they get enough light is essential if you want a decent yield. These plants keep things simple for growers, and can be a great start for beginners. Photoperiod plants, which many growers are familiar with, are the opposite and require special light schedules to jump start the plant into flowering mode. Let's take a closer look at autoflowering cannabis, and how to provide enough light to create the optimum conditions for a potent and high yielding harvest. 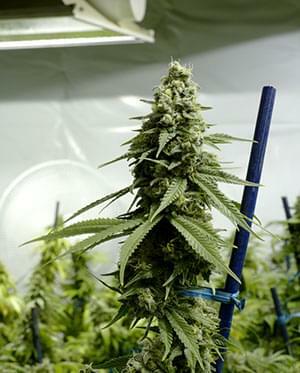 Most agree that giving 18-24 hours of light is ideal for auto-flowering plants. As autoflowering plants do not rely on hours of light to tell them when to flower, they can be subjected to a 24- hours of light throughout their growth cycle. In fact, many growers believe 24 hours of light is crucial when growing autoflowering plants, as it may give them the best chance to grow bigger in the vegetative stage and then eventually flower accordingly. Cannabis is classed as a C3 plant, meaning it can absorb CO₂ during periods of light for photosynthesis. This theoretically eliminates the need for darkness, as they do not need periods of dark to photosynthesis, unlike C4 plants. Autoflowering plants have also evolved in the northern areas of the world where they receive near to 24-hours of light as standard during the seasons of growth. As such, it is safe to say that autoflowering cannabis can thrive under 24-hours of lighting. There are a couple of reasons you may opt not to use a 24-hour light cycle. Firstly, while some believe 24 hours gets the best out of the plant, others believe a period of darkness allows the plant a period of rest and recuperation essential to healthy growth. Also, having lights on for 24-hours a day may be unpractical for some. Using such a schedule will increase the heat of a grow room, so if you live in a very hot and dry area, this can be hard to manage. Having lights on permanently can also rack up energy bills. Using an 18-hour light cycle allows you to shut the lights off during the hottest hours of the day, saving energy, money, and potential problems. SO WHICH IS BEST, 18 OR 24 HOURS OF LIGHT? When it comes to picking the right light schedule, you need to weigh up the pros and cons to assess which is best for your situation. Personally, we have grown more under 18-hours of light, but the ones we have done under 24-hours have been very successful as well. Some even like to take the middle ground, using a 20-hour light cycle. This offers the best of both worlds. One thing is for sure; you do not want your autoflowering plants to receive less than 18 hours per day. This is the minimum, and anything less will adversely affect growth. At the end of the day, each grower needs to do what works for them. It is worth experimenting with both light cycles (on two separate grows), to see what gets you better results, and what suits your grow situation better. 24-hour lighting offers greater potential, but it may not always be practical. Either way, both light cycles will see your autoflowering cannabis flourish, so happy growing! Should You Hand Trim Or Machine Trim Your Cannabis? Albino Weed: The Stuff Of Legend Or Scientific Fact?